What’s that over there on the horizon? It’s your retirement, coming close. Yes, it’s still some years off, but you can see it now in the distance. How do you feel? Excited? Uncertain? Full of dread? 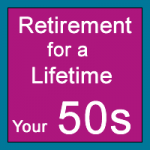 By now, you should have several decades of retirement savings under your belt. If not, you will have to work hard to catch up and you may even need to rethink what your retirement will look like. The closer you come to your retirement, the more clearly you’ll be able to see if all of your planning is going to hit the mark. If you’ve created a retirement plan, then you should have some idea of how much you want to have saved when that long anticipated day comes. Is your current plan of saving and expected income, including Social Security, going to get you there? If not, then it is time to revise your plan. If you are behind in your retirement savings, now is the time to really get serious and start playing catch-up. You should definitely be maxing out your 401(k) contributions and IRAs. Now that you are over 50, you can also take advantage of special catch-up rules that allow you to put more money into these accounts. In 2015, those over 50 are allowed to put another $6,000 into their 401(k) plan or another $1,000 into an IRA. Now that you are in your 50s, your children have likely flown the coop, or are getting close. You may even be done saving for college (finally!) Also, if you’ve been faithfully paying down your mortgage, this decade may see you write your final check and become the true owner of your home. Since you are already used to living life with these expenses built in, why not divert this freed-up cash directly to your retirement account? Unfortunately, not everyone will be able to catch up entirely. If you failed to save adequately for retirement in the early decades of your working life, your ability to take advantage of compound interest will be greatly diminished. It is still a good idea to increase your savings, but you may need to consider working past the age of 65, delaying Social Security distributions, working part-time, or moderating your plans. If you live in a high cost area, like San Francisco, Los Angeles, New York, or Chicago, you may even want to consider moving to a lower cost area. Consider that the median price in San Francisco for a single-family home recently hit $1 million, while the average home price in Brentwood, California, less than two hours away is $480,600. As you come closer to retirement, your retirement portfolio allocation should become more conservative and less risky. You no longer have the time to ride out big drops in the market. If you tie your retirement up in risky stocks that drop 30% or more, you could see your retirement dreams evaporate. It’s always a smart idea to work with a financial advisor to create a plan that is right for your retirement goals. To learn even more great information about how to save and plan for your retirement, no matter whether you began planning early or late, visit our retirement article archive.